I was introduced to Bentonite and Rhassoul clays a few years ago, and I must say this has to be a natural head's must have. Both clays have high percentages of natural minerals. These make the clays highly detoxifying as they can actually exchange themselves for toxic compounds like metals in the hair and skin. Perhaps the best part, is that the clays don't contain harmful sulfates, synthetic preservatives, petrochemical derivatives or cones. The hair becomes extremely soft and manageable naturally after just one use. Try one of these treatments once or twice a month to cleanse the scalp and hair. Use a non-metal bowl and utensil. It will clarify your hair like no other. That's why I only used this once a month. Is a little harder to rinse out.This recipe depends on the length and thickness of your naturally curly hair. So be prepared to add as needed. Apply clay mixture to wet or damp hair in sections, starting from the back and moving forward. Do not rub. Slowly add *water to the clay until you achieve a pancake mix consistency. One single treatment of Bentonite Clay will remove build-up from your scalp leaving natural hair clean without using harmful sulfates. Bentonite Clay may also be used like a shampoo, trapping and removing dirt, debris, build up and other particles from your hair and scalp. Mix Clay with equal parts of raw apple cider vinegar and/or water. Use a non-metal bowl and utensils. Stir the mixture well to a smooth paste. Apply to the face or neck area. Let it dry for 5-10 minutes for delicate skin. For normal skin let dry for 15 - 20 minutes. You will feel a pulling and tightening sensation. Remove clay by washing with warm water. This wonderful facial will remove impurities and dirt from the pores. 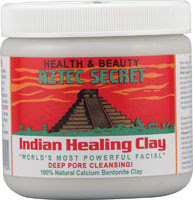 When you first start using the clay, experts suggests applying the mask on a daily basis for at least the first two weeks. After that, you can scale down to two treatments a week. Will clarify but has conditioning properties as well. This mix can be used weekly with out drying the hair out. A lot easier to rinse out when compared to bentonite clay.This recipe depends on the length and thickness of your naturally curly hair. So be prepared to add as needed. Apply clay mixture to wet or damp hair in sections, starting from the back and moving forward. Do not rub. 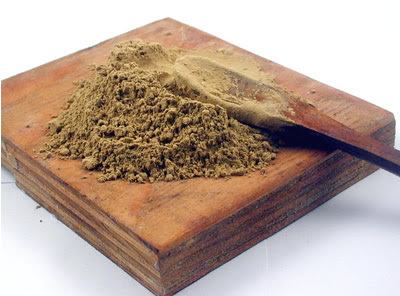 The clay will clean the scalp and hair, leaving healthier follicles. Allow to set for 10 minutes for dry hair or 20 minutes for oily hair. One single treatment of Rhassoul Clay will remove build-up from your scalp leaving natural hair clean without using harmful sulfates. Rhassoul Clay may also be used like a shampoo trapping and removing dirt, debris, build up and other particles from your hair and scalp. I want to try this but where do you buy it? Whew! Great info! Thanks for sharing. I'm experimenting with these products as well and will report the results on my blog. Feel free to visit it. . .it's teefood4thought.blogspot.com.